Since day one here at In Focus Eye Center, we have chased perfection with unrelenting passion. Just take a look at some of the things that our patients have had to say about their experiences with us. If you need more convincing you can read more reviews on Yelp or Google. Great experience start to finish. The doctor was friendly and answered all my questions. The tech was super helpful as well, absolutely nailed the glasses I was looking for. I'm glad to find an eye care office I won't dread visiting. Thank you!Great experience start to finish. The doctor was friendly and answered all my questions. The tech with the short blonde hair was super helpful as well, absolutely nailed the glasses I was looking for. I'm glad to find an eye care office I won't dread visiting. Thank you! This is the most comprehensive educational eye exam I have ever received. The office was easy to find, impeccably clean, and the staff was incredibly friendly and polite. I have never had my vision health explained to me so precisely as to what is happening and what I need to do to get to where I need to be. The eye doctor also gave me a pair of contacts to try out and then set me up with a follow up appointment in a week to see how they are working out. This not only saves me money but I feel as though I've found a vision office that actually cares about me and my eye health. I have had the most incredible eye doc experience at In Focus. I came in post partum and my eyes had changed for the first time in a decade. Everyone was so friendly and helpful, even after more than my share of appointments. I would drive from anywhere to go back for such wonderful customer service. 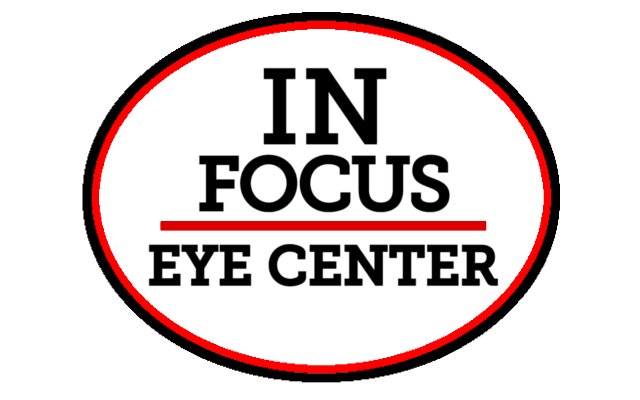 HIGHLY recommend.I have had the most incredible eye doc experience at In Focus. I came in post partum and my eyes had changed for the first time in a decade. Everyone was so friendly and helpful, even after more than my share of appointments. I would drive from anywhere to go back for such wonderful customer service. HIGHLY recommend. They were so amazing! The front staff was so much fun, nice, and full of life. Stephen helped me pick out my glasses, which I loved their selection. The optometrist was sweet and explained everything concisely and simply. They finished filling my prescription in 45 minutes and gave me a free coffee card to go across to iman perk while I waited. When they heard my husband was coming to pick me up, they gave me a 2nd coffee card for him. I will definitely be returning here and recommend this place to any and everyone !They were so amazing! The front staff was so much fun, nice, and full of life. Stephen helped me pick out my glasses, which I loved their selection. The optometrist (Dr. Jen) was sweet and explained everything concisely and simply. They finished filling my prescription in 45 minutes and gave me a free coffee card to go across to iman perk while I waited. When they heard my husband was coming to pick me up, they gave me a 2nd coffee card for him. I will definitely be returning here and recommend this place to any and everyone !